A woodpigeon and 2 collared dove were at Holland plus 3 swift over, a chiffchaff was at the Surgery and a sand martin at Hooking. 4 bar-tailed godwit were at Westness, 3 crossbill were seen and a sparrowhawk flew along the Links. The red-necked phalarope on Gretchen Loch was joined by a 2nd later in the morning, with 2 pintail there also. A swift flew over the Obs' and a woddpigeon and 3 collared doves were at Holland. A whimbrel was at Garso and 12 curlew flew south, whilst at least 21 crossbills were at Southness. 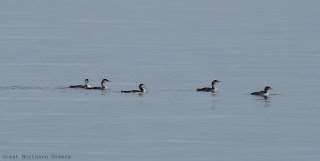 A female red-necked phalarope was on Gretchen Loch through the day, a grey heron flew over the Observatory and a red-throated diver was in Nouster Bay. A chiffchaff was at the Surgery, 3 collared doves at Kirbest and 3 sand martin over Hooking Loch. A whimbrel and a purple sandpiper were seen along the north coast, a swift was seen over and a flock of 30+ crossbill flew past Neven. 2 quail were singing below Holland House in the afternoon. A crossbill flew over the Obs' in the morning and a woodpigeon and chiffchaff were at Holland. A greenshank was seen at Garso, a grey heron was at Hooking and 3 great northern divers were in Nouster Bay. 2 black-tailed godwit were on Gretchen Loch and 137 golden plover in Loch Park. 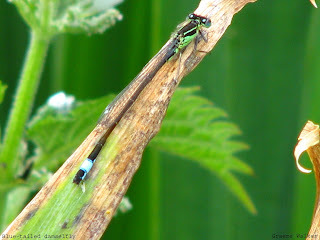 After a single on 23rd, 10 blue-tailed damselflies were at Garso Loch today. The first observatory record. 4 collared doves were at Holland and a swift was seen at the north end. On Gretchen Loch were 4 wigeon and 5 dunlin. A single swift was over the north end and an hour seawatch produced 4 manx shearwater and 7 storm petrel. 5 great northern divers were off Westness, 3 chiffchaff were seen and a marsh warbler was trapped at Holland. Other bits of interest included 4 bar-tailed godwit, a grey heron, 2 collared dove and a sand martin. 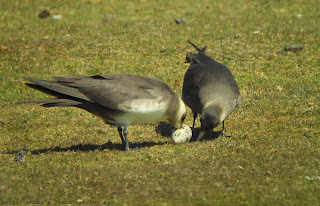 73 golden plover were counted at various sites, 2 great northern divers were in Nouster Bay and a collared dove was seen. A quail was flushed near the Observatory, a grey wagtail flew over and the 2 black-tailed godwit were on Gretchen Loch. 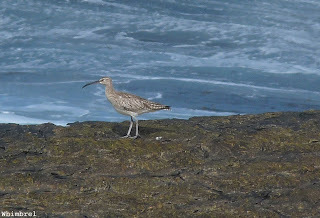 At Westness were 2 whimbrel. A chiffchaff and 2 collared dove were at Holland, 2 sand martin and a grey heron at Hooking and 41 golden plover were in Mid Park. 2 black-tailed godwit were on Gretchen Loch and 3 whimbrel flew over the Observatory. 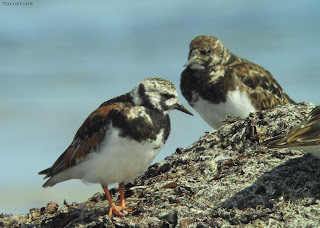 The juvenile stonechat had moved to Holland, a red-breasted merganser was in Nouster Bay and the corncrake was singing late in the night at Peckhole. The only noteworthy sightings were of a spotted flycatcher at the Surgery, and a chiffchaff at the Observatory. Golden plover are slowly increasing with 35 at Kaven today, a red-throated diver was in Nouster Bay and a sand martin at Hooking. 2 collared dove and a chiffchaff were at Holland, a juvenile stonechat was at Sangar, a common sandpiper by the pier and on Gretchen Loch were a common tern and 3 knot. Very little worth mentioning, with just 2 collared doves at Holland and 2 swift over. 29 golden plover were at Westness. A female red-necked phalarope was on Gretchen Loch for a couple of hours in the morning, with a curlew sandpiper and 4 knot. 5 swift and a sand martin were seen at the north end, 4 chiffchaff included new birds at Rue and Sangar and an osprey came in at Twinyas mid-afternoon. 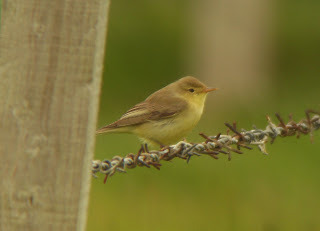 The garden warbler was still at Holland and 2 chiffchaff were seen. A sand martin was over Hooking Loch and a great northern diver was in Nouster Bay, whilst notable waders included 14 knot, a curlew sandpiper and a little stint. In the evening 5 killer whales were spotted from the beer terrace at the Observatory. 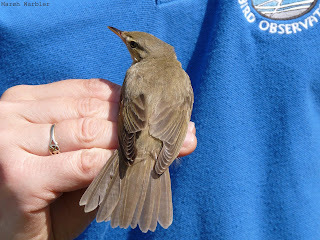 A garden warbler was trapped at Holland in the morning, with a chiffchaff there also. The corncrake continues to sing at Peckhole, 2 collared dove were at Kirbest and 16 golden plover at Sandar. A swift was seen in the evening and an hour seawatch produced 9 manx shearwater. 2 chiffchaff were trapped at Holland early morning, with a garden warbler there in the afternoon. A common scoter was amongst an eider flock off Gue Park, 5 swift were over Nether Linnay and a little stint briefly joined the curlew sandpiper on Gretchen Loch. The corncrake was still singing at Peckhole and the curlew sandpiper on Gretchen Loch was joined by 2 black-tailed godwit. A chiffchaff and a collared dove were at Holland. The curlew sandpiper was still on Gretchen Loch and 2 collared doves at Twingness. 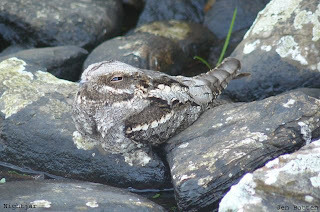 A nightjar flushed at Viggay was a welcome surprise as always, whilst at the north end were 3 whimbrel, the only purple sandpiper for some time and a manx shearwater was seen. The curlew sandpiper was still on Gretchen Loch and 6 black-tailed godwits dropped on there briefly. A lesser whitethroat was singing at Holland, 2 chiffchaff were seen and 3 great northern divers were in Linklet Bay. The corncrake was singing early morning at Peckhole and a sparrowhawk flew north. 3 chiffchaffs were still present and a curlew sandpiper was on Gretchen Loch. At the north end were a white wagtail and 2 little terns flew over. A common redpoll and 11 woodpigeon were seen in the morning and later a marsh warbler singing at Sangar added some excitement to another quiet day birding. And some good news from an islander was of a singing corncake at Peckhole. A chiffchaff and a collared dove were at Holland and a whimbrel flew over. It surely can't get any quieter with just 2 jackdaw, 2 chiffchaff and a sand martin of note today. The 2 whooper swans were still on Garso Loch, 17 sandwich terns in Loch Park and a flock of 55 knot were at Sennes. 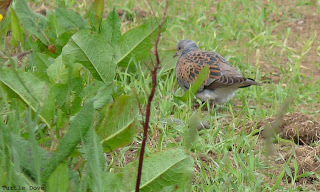 The turtle dove was seen again at Holland with 2 collared doves and a chiffchaff also there. Another chiffchaff was at the Surgery and a blackcap was at Viggay. 3 house martin and 2 sand martin were over Gretchen Loch, a great northern diver was in Nouster and a manx shearwater was seen. A collared dove was at Holland and a sand martin at Brides'Ness, whilst new migrants included a willow warbler at Quoy Banks and a grey wagtail at Bewan. 3 red-breasted merganser were in Nouster Bay and 2 chiffchaff were seen. A turtle dove was new for the year at Holland with a sand martin there also, a lesser whitethroat was at the surgery and a chiffchaff was still present. A siskin was at Kirbest and a curlew sandpiper and a black-tailed godwit were seen. The day started well with a garden warbler and lesser whitethroat trapped at Holland and an icterine warbler at the Observatory, but never picked up from there, with just 3 chiffchaff and 3 house martin. The first little stint was seen on Bewan Loch, 2 bar-tailed godwit were at Bridesness and 4 collared doves by Kirbest. It remains quiet with a common rosefinch the highlight. Elsewhere were a swift, 4 house martins, a sand martin and 2 chiffchaff. A basking shark was off the Foghorn in the evening. 2 woodpigeon and a male grey-headed wagtail were at the Observatory in the morning, a siskin was at Quoy Banks and 3 chiffchaff and 3 spotted flycatcher were seen. A marsh warbler was at Kirbest, 4 house martins at Vincoin and the 2 whooper swans on Garso Loch.